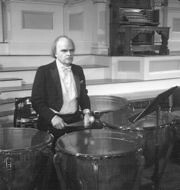 Gary Spellissey teaches percussion at Powers Music School, where he also chairs the Percussion Department. He received a Bachelor of Music Education degree from Lowell State College and a Master of Music degree from Boston University. His performances include Chatham Chorale, the Boston Pops, Merrimac Valley Philharmonic, the Portland Symphony Orchestra, and with Cyd Charisse, Ruby Keeler, Nipsy Russell, and Lorna Luft. Gary is an artist/clinician with Remo Company, as well as an educator/clinician with Vic Firth, Inc. His teaching experience includes All Newton Music School, University of Massachusetts-Lowell, Gordon College, and Lawrence Academy.